Just a few things to know… Brussels isn’t a cheap city, especially when it comes to eating out so to avoid some sticker shock, you should go into it knowing its one of the best gastronomic foodie cities in Europe but it comes with a price. Even though Brussels is located in the Flanders region, it’s predominantly native French speaking…but don’t fear, almost everyone you encounter will speak English. It’s a big English speaking city so don’t hesitate to stop someone on the street and ask for directions/questions, etc. For something less business-like with some local flare, check out the Welcome Hotel in the Saint Catherine area. Some friends of mine have stayed here after we had already moved away. Osteria A l’Ombra – authentic Italian right near Grand Place. My husband and I ate here often. It’s owned by a Sicilian family and the youngest, Alfonzo, is great and speaks the best English and always took care of us. Toscana 21 – LEGIT Italian. The owner drives to Italy every 6 weeks to get his ingredients. It’s a small menu but I’ve never had anything bad, always amazing. It’s near the Sablon. 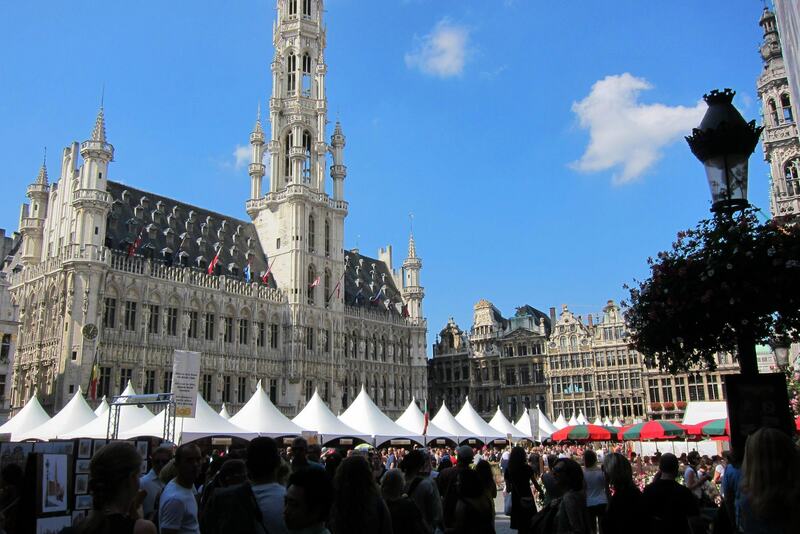 Belga Queen – traditional Belgian food near Grand Place. It’s inside a really beautiful building. If you don’t eat here, their bar area is great for a drink. Cafe de la Presse – for brunch. Its DELISH and often hard to get into if you wait until noon. The location on Avenue Louise is the most central and a tram stops right in front of it. Le Perroquet for lunch – up by the Sablon area, walkable from Grand Place. Really cute, but small. Extensive pita sandwich menu and lots of cocktails to choose from. Fornostar – I know the name always threw me off too…it’s a pizza place in St. Catherine that also serves other good Italian. Cospaia – “posh” We came for dinner once but more often we came for just drinks and hanging out on the terrace on nice evenings. Tram Experience – A tram has been turned into a white table cloth restaurant and it travels around the city and stops at notable restaurants that feeds you their specialty on the tram. I was never lucky enough to score a reservation but our friends who did enjoyed it. This ran right in front of our flat and I was always so jealous. Tasso – in Tours & Taxis building which is an old train station. I love this place. It’s on the inner ring of Brussels but not walkable. There’s also a wine bar in this old train station if that tickles your fancy. O Restaurant – we did the 4 course tasting menu with wine pairing for my birthday one year and it was amazing! Le Chalet de la Foret – Two Michelin star in the middle of the forest. $$$$! It’s a real treat. Le Monde est Petit – two words: Lobster Ravioli (if they have it, it’s seasonal). This is one of our friends’ favorite resto. Dinner in the Sky – I saw this once and it was a spectacle. I can’t imagine what something like this costs or how easy it is to reserve but what a treat! Grand Place – This is the center and heart of Brussels complete with beautiful architecture, chocolate stores galore and even a beer museum. You will likely find yourself here many times during your stay in Brussels. Cantillon Brewery – if you’re interested in breweries. It’s the last one in Brussels and is a metro ride, not walkable from Grand Place. It’s a sour beer (geuze) so be prepared….My husband loves it, I do not. Their cheeses are good though! Etiquette Wine Bar – we loved this place for happy hours. Think wine on tap…and lots of it. It’s not walkable from Grand Place but you can get close enough on the metro/trams. Delirium Cafe – They used to hold the world record for number of beer varieties available. They try to have the total number for the year. I.e. 2014 beers to choose from. It’s in restaurant row so you can experience the harassing of restaurant owners trying to get your business. After about 11pm, it turns into a hot spot for teenagers so go mid afternoon to get a good experience. It’s huge and dark but a must Brussels experience. Don’t eat here. Jannekin (mannekin pis’s female counterpart) is also in this alley that you can see. Renee Magritte Museum – This is one of my favorite art museums. It’s not too big and has some great modern art by Magritte. Look at his work online before committing to see if it’s for you. It’s located right by the MIM restaurant. Parlaiment – The EU headquarters are here. I can’t believe I never visited even though it was in my backyard but if you’re interested, I heard it’s a neat visit. Look into tours as opposed to just showing up. During happy hour, the lawn out front fills with tons of expats/locals having drinks on the patio of the restaurants. It’s a youngish crowd. 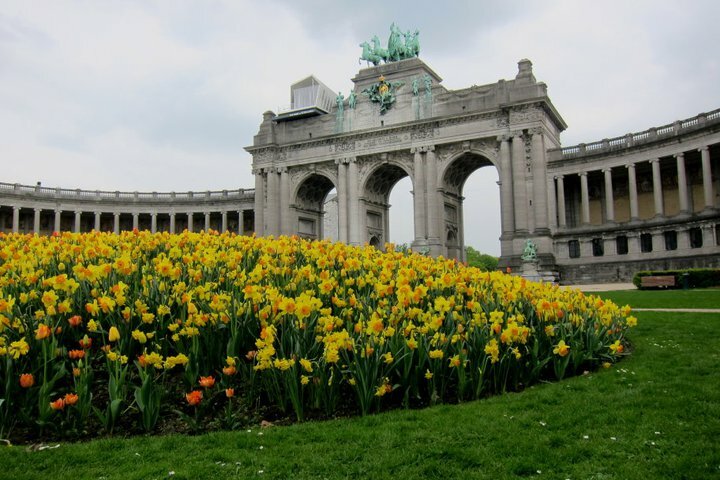 Cinquantenaire Park – This is my favorite monument in Brussels. It was practically in our backyard so I may be bias. There’s a antique car museum here that is really neat even for girls who aren’t interested in such things. It’s easy to get to as it’s right at the Schuman metro station for the park/view or Merode station to start with the museums. King’s Palace & Park – Good for pictures. It’s only open one day/year for tours. Walkable from Grande place. Place du Chatelain outdoor market – if you’re visiting on a Wednesday, take the train up to the Chatelain. They have an outdoor market with fresh vegetables and fruit and various meats and everyone stands out in the streets hanging out. It’s a must on a non-rain Wednesday! Very local. Basilica of the Sacred Heart – This church isn’t much to see on the inside, but the view at the top is really nice. I wouldn’t necessarily say it’s worth the trip out to the church though. You can see the Atomium from this view. Atomium – It’s nice to take a pic in front of it…but that’s about it… you can also see it from the Palace of Justice right near the Sablon. It’s nicest at night all lit up. Mannekin Pis – Located near Grande Place, sometimes wearing a costume (there’s a whole museum dedicated to his costumes). There’s always a swarm of people around this miniature statue of a little boy peeing but go, snap a picture and notice the comics paintings on the side of buildings in the area. Speculoos cookies – it also comes in various chocoloates but it’s a Belgian specialty, usually in cookie form. Sometimes it’s served with the bill in lieu of a mint. Waffles – Get the Liege style (MUST) with whatever toppings you like (speculoos even). Also, I hear they’re best from the Waffle vans which I normally saw up by the modern art museum and on Avenue Louise. Otherwise, we always took people to Au Gaufres de Bruxelles which is right in the center. Maison Antoine – This fritte (fries) stand is the most famous in Brussels…there’s always a line. It’s close to Cinquantenaire Park. People generally make a meal of them but you all can split an order for an afternoon snack, easily. Chez Leon – Its a big tourist trap admittedly. BUT it has the most extensive selection. It’s on restaurant row right off Grand Place and gets crowded very quickly. But we never had to wait long for a table. Le Pre Sale – I have not been to this place but another Brussels friend recommended it for mussels. General note: They’re not really good out of season (though our guests never complained) – the rule of thumb is, if the month has an “R” in it, they’re in season (basically through winter months, not so much in summer). Neuhaus – Best bang for your buck. If you’re buying chocolate gifts, go here. They have good options for box sizes that you can customize for a very reasonable price (relatively speaking). They are everywhere, also in Grande Place. Mary’s – The royal family’s favorite. It’s very good chocolate but at a very expensive price. You can always pay per piece if you just want to try it. I really love their sea salted caramels. You can find it near Mannekin Pis and also in Les Galeries Saint Hubert near Grand Place. Pierre Marcolini – Definitely my favorite chocolates. They have set boxes that are a little pricey, but worth it. Don’t share, splurge for yourself! They have two in the Grande Sablon (where the Toscana 21 resto is). Pierre Ledent: Parisian lovers will probably disagree due to loyalty but I swear they’re better than Laduree. They’re the best macaroons I’ve EVER tasted. It’s right off Grande Place with a hot pink sign. My favorites: Rose, Violet with blueberry center, and Caramel with sea salt…but you CANNOT go wrong. Every time I was down in the center, I had to buy some a la carte for a snack 🙂 Skip the chocolates here. Filet américain – Very finely minced ground beef eaten raw and cold. It is mixed with onions and capers like steak tartare. Bloedworst – a type of sausage in which the meat, or blood, is mixed with fine breadcrumbs. Often eaten with potatoes and apple sauce. Stoemp – potato mashed with vegetables (usually carrots or cabbage), often served with sausages. Carbonnades Flamandes / Stoverij – a Belgian beef stew, similar to the French Beef Bourguignon, but made with beer instead of red wine. Served with fries usually. Vol-au-vent – Basically inside-out chicken pot pie. You’ll also see horse (cheval) and rabbit (lapin) on many menus. Westvleteren 12 or 8 – Only sold at the abbey but you can buy one at the Bier Tempel near Grand Place for a price. A close tasting alternative is St. Bernardus Abt 12. Brussels is known for many things…. they have mastered all things frites, chocolates, and beer as we now all know…but who knew that Belgium is known for Lace!? That’s right, you can buy anything from christening gowns, baby onsies and little dresses, handkerchiefs, wedding veils, linens, and my favorite, Lace Christmas ornaments! All are easy to pack and light weight! Rick Steves has two really good walking tours of Brussels Center which we frequently did with our visitors. It’s the most efficient way to see all the main must-sees while getting some history. Also, at Gare Central (right by Grande Place) there are always the red hop-on hop-off buses which I know seems cheesy, but if it’s raining…its a good alternative. You can get off at any stop and get back on when you’re ready to go to the next place. Plus, the bus takes you by the Atomium which is on the out-skirts of town and some of the royal family’s palaces and the unusual chinese and japanese houses that you wouldn’t go to otherwise. Also, opt for a money saving tour by taking one of two walking tours offered daily for FREE! Belgium is QUIRKY! You will see things and scratch your head wondering what and why but just embrace and absorb it all! I hope you all leave loving this city as much as I do! This entry was posted in atomium, basilica of the sacred heart, Belgium, breweries, Brussels, Cantillon, chatelain, chocolate, cinquantenaire, Grand Place, Mannekin Pis, Mussels, neuhaus, pierre marcolini, speculoos, Travel, waffles and tagged Belgium, Brussels, Europe, travel. Bookmark the permalink.